Mao cha can be made from the fresh leaf of one tea garden or be a blend of leaf from an entire tea village or from several tea producing villages within one county. Mao cha can be stored and aged after it is made, or it can be a new blend that is comprised of aged mao cha from different years. It is found in a variety of leaf sizes, too, depending on the location of the tea trees and on the type of local cultivars (size of the leaf) the mao cha was made from. Mao cha is a great example of the effects of terroir. 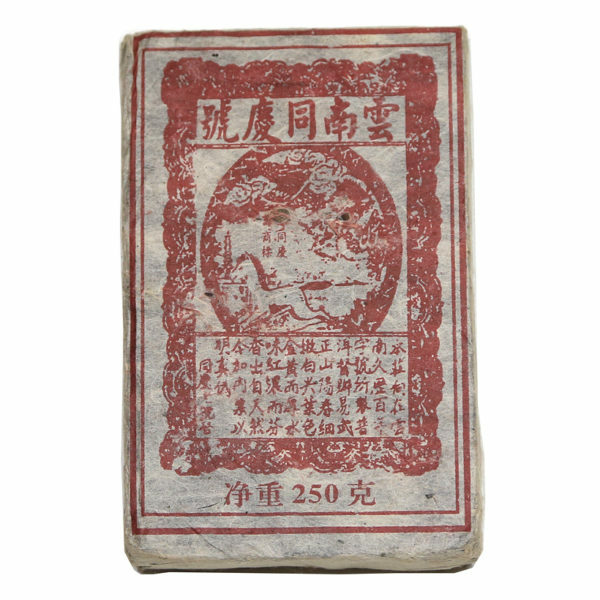 This is a mi zhuan – a thin, compressed brick of shou Pu-erh. It was pressed in 2005 from leaves and stalk plucked and fermented in the Yiwu tea harvesting region in 2003. The zhuans have been well maintained in dry storage for 6 years. The Yiwu Tong Qin Hao tea factory has a long history in Yunnan and enjoys a respected reputation. This zhuan features their simple, original stamped design on am otherwise plain paper wrapper. It is utterly charming and replicates how stamp marks/ company marks looked before modern attitudes of branding came into play. The paper is thin and has a hand-made look and feeling. The simple image in red is that of a dragon, a pagoda and a horse. Dragon might signify the universe, the pagoda is perhaps a reference to mankind and the horse could symbolize earth. The tea in this mi zhuan is made from Yiwu leaf materials (Mengla County, Xishuangbanna Prefecture) and the tea is mellow and sweet. The combination of aged Yiwu leaf and stalks contain a high amount of amino acid which adds good flavor and smooth, rich mouth-feel to the liquor in the cup. The liquor is a lovely red color.